This is the last week of physics runs for the LHC during 2011 before the winter shutdown. The last few weeks have been occupied with heavy ion physics which has been going very well. The luminosity lifetime during fills is much less for heavy ion than it is for protons which means they have to be much shorter. On the other hand the lower radiation means that the fills can be reinjected much faster and there are a lot less problems that get in the way. The overall effect is that the heavy runs have been much more trouble-free except for a few days lost to cryogenic outages. The luminosity collected will be about 150 to 160 inverse micro-barns in each of the three experiments CMS, ATLAS and ALICE. This compared with only about 10 inverse microbarns last year so there should be big improvements in the physics to look forward to when they report over the next few months. With new physics also about to be reported from the analysis of 5/fb of proton luminosity per experiment gathered in 2011, they are now looking at how much more will be produced during 2012. Readers of viXra Log will know that my estimates for 2011 turned out to be a bit optimistic so I am relieved that this time Steve Myres himself is sticking his neck out to give some predictions which should be better than mine. These were presented this morning at the LHCC Meeting that also included reports from the individual experiments. These have been recorded on video for anyone who is interested. Myres has based his estimates for 2011 on two scenarios. The first is running with 50ns bunch spacing as they did this year, using a squeeze with a beta* of 0.7 and 4 TeV beam energy slightly above this year. The number of bunches, intensity and emittance would be kept at around the levels at the end of this year and cannot be pushed up much further due to injector and intensity limits. These parameters are just a working hypothesis. The final plan will be drawn up at the Chamonix meeting in February as usual. There are 148 days available on the schedule for proton physics runs next year and based on 2011, a Hubner Factor of 0.231 is assumed. This provides a predicted luminosity accumulation as shown in the following plot. 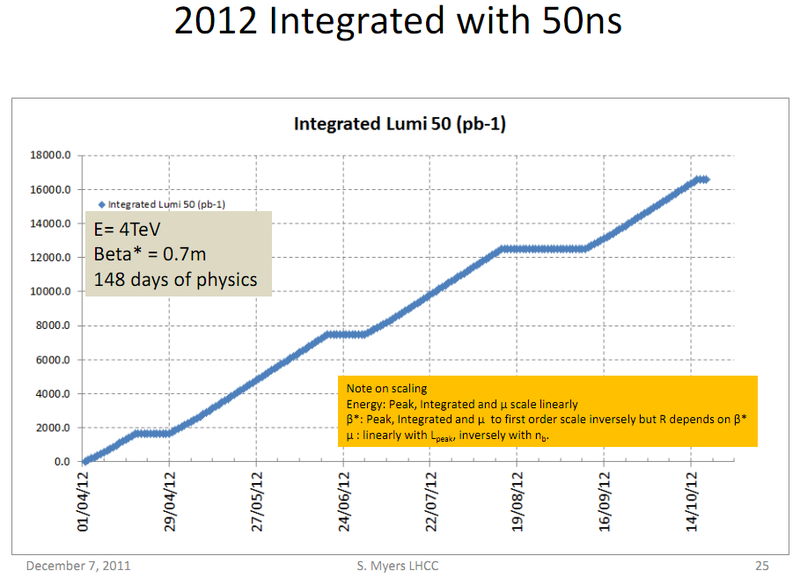 As you can see, this would give them over 16/fb of integrated luminosity, more than three times that delivered this year, but variations in the Hubner Factor mean that this should be regarded as just a crude estimate. One potential problem is the high pile-up that this would provide. in other words there would be more collisions per beam crossing than the experiments would like. The number is about 27 on average for this set of parameters. The pile-up makes it very hard for some types of analysis, especially where missing energy is involved, e.g. processes that produce neutrinos or unknown dark matter WIMPS would be harder to see. Several solutions are possible each with its disadvantages. One solution is to use 25 ns spacing instead of 50 ns. The better spacing would decrease pile-up by a factor of three for just a little less luminosity. Myres worked out a corresponding prediction for luminosity giving about 11/fb for this case. I understand that the experiments would prefer this but the beam operations group are cautious because there are further unknowns that could reduce the luminosity further at 25ns spacing. It may be harder to reach beta* of 0.7, there may be limits to the total intensity due to heating and some unknown amount of time would have to be dedicated to scrubbing to remove the e-cloud effect. Myres proposed that instead of using 25ns spacing the experiments might care to accept some luminosity leveling during the start of fills to reduce peak luminosity and pile-up. He also had a suggestion to use bunches of different intensities to get some lower pile-up bunch crossings at the same time. This turned out to be an unofficial unapproved suggestion that reached Myres from an individual in one of the experiments according to the spokesperson. I will make the even more unofficial suggestion that they aim for long runs and use the lower end of run luminosity for the experiments that suffer from pile-up. The maximum possible luminosity will be needed next year to get conclusive statistics for the Higgs Boson if it is confined to a low mass region such as 125 GeV. Only the diphoton and 4 lepton channels have the resolution and sensitivity to see the Higgs there, and they will need the full amount of luminosity predicted by Myres. These observations are less affected by pile-up because the rare high-energy photons and leptons are directly detected as they emerge from the collision chaos. I suspect that this case will win the day and they will run at 50ns rather than the more risky 25ns with lower luminosity. Myres also went on to look ahead to 2015 after the long shutdown when the LHC will return with repairs that will allow it to get nearer its design energy. The scenario considered is an energy of 6.5 TeV per beam, beta* of 0.5 and 50ns spacing. The full energy of 7 TeV per beam will not be available until later because early experience with the magnets showed that they are not yet ready for training to maximum magnetic field. With 50ns at 6.5 TeV the pile-up reaches 50 which could be a problem. With the increased energy the priority will return to looking for dark matter candidates that might show up as missing energy (SUSY or otherwise). The 25ns option will also be on the table offering a more acceptable pile-up of 17 with an integrated luminosity of 22/fb during the year, subject to the unknowns. My guess is that the 25ns will be favoured, but this depends on physics results that may be seen during 2012. A further meeting at EVIAN is scheduled for next week where the beam operation groups will go over the technicalities in much more detail. We however will be distracted by news of the Higgs. Meanwhile, well done to the operation groups for a very successful year. This entry was posted on Wednesday, December 7th, 2011 at 8:47 pm and is filed under Large Hadron Collider. You can follow any responses to this entry through the RSS 2.0 feed. Both comments and pings are currently closed. As to “… Only the diphoton and 4 lepton channels have the resolution and sensitivity to see the Higgs …[in]… a low mass region such as 125 GeV …”. Are there any rumors about the 4 lepton (Higgs to ZZ to 4l) channel ? ATLAS also saw about 1 event per bin. Should CMS and ATLAS both be seeing an average of 5 events per bin ? Could the presence or absence of 5 events per bin be a good indicator of a signal or no-signal in the 100 to 130 GeV range ? The WW channel is sensitive in theory but its broad resolution means it can’t tell us very much. The digamma should be sensitive to just 2-sigma at the combined 10/fb so if they have 4-sigma as rumoured then they have perhaps been lucky with the stats and may not be so lucky with the next 10/fb. ZZ will become promising next year with 40/fb especially if they can increase energy from 7 to 8 TeV. The prediction is based on steady luminosity and Hubner factor throughout the year. Assuming they can do no better on instantaneous luminosity, wouldn’t one expect a far better Hubner factor for 2012 than 2011 as they kept raising the luminosity all through this year, causing problems that wouldn’t have happened if they’d kept the luminosity the same? All that aside, I’ll just throw the official estimates out the window and go with the 40/fb I randomly came up with some months ago. Ah, I read too much into the words “based on 2011” and thought it was the average for the entire year. What are the implications of mixing 7 TeV and 8 TeV data, assuming they raise the beam energy next year? It will increase the production rate for Higgs, but also the background. Overall it improves the stats. Mixing the data at different energies is not a problem. They also plan to combine with data from the Tevatron which has a very different energy. So long as they calculate the expected background and signal independently for each change of energy and other parameters and add them up, there is no difficulty. Loops are not strings, but D1-branes might be interpreted as loops. I am not aware of such a development at this time. The D1-branes attached to D0-branes in the BFSS matrix theory might play a role similar to loop gravity variables.